STEP 1:	WHO Do You Want to Sell To? STEP 2:	WHAT Quantity Do You Want To Sell? 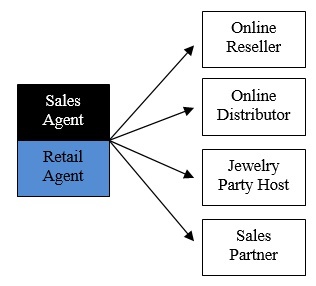 The Merchant Sales Channel is designed for Home Based Business Owners to sell products Directly to Customers face-to-face and/or via Online and/or by Hosting a Jewelry Party OR for a Retail Shop Owner wishing to sell complimentary Jewelry Products to their walk-in Customers via their existing Retail Outlet. 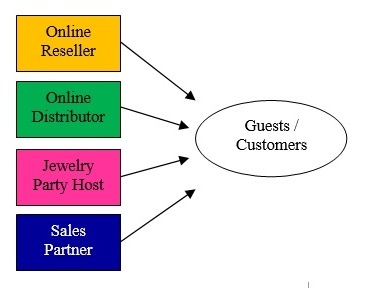 Merchants sell direct to Customers and usually defined as Jewelry Party Host, Online Reseller, Online Distributor and/or Retail/Sales Partner. Our Wholesale Sales Channel is designed for Home Based Business Owners and/or existing Independent Sales Representatives wishing to sell via/to their own Network of Merchants. Retail/Sales Agents earn Commission by appointing Jewelry Party Hosts, Retail/Sales Partners and Online Resellers & Distributors to resell products direct to Customers. This is our Premier Sales Channel and is designed predominantly for existing Importers & Business Owners wishing to sell MexZotic Jewelry products via established or new Wholesale and Merchant Channels. Retail Importers can appoint Retail/Sales Agents, Jewelry Party Hosts, Retail/Sales Partners and Online Resellers & Distributors. Merchant Sales Channel: No upfront or ongoing cost to become a MexZotic Merchant. Online Reseller: Online Reseller typically sells online to Family & Friends. Contact us about our FREE membership plan. Buys at Member Level Discount and sells at Profit. Online Distributor: Online Distributor sells online to Family & Friends and via online Discount Shopping Sites such as eBay, Brands Exclusive Etc. Contact us about our FREE membership plan. Buys at Member Level Discount and sells at Profit. Jewelry Party Host: Jewelry Party Host will be rewarded with a FREE Gift up to $100 value, Discounts and Credits on other items. Our Sales Agent will provide all the Jewelry samples for order/sale at the Party. No Cost for Host and Upgrade available to Sales Partner. Retail Partner/Sales Partner: Retail or Sales Partner can buy jewelry at discounted prices and sell face-to-face to Family & Friends, Co-Workers, Market Stands and general Retail Customers. Buys at Member Level Discount and sells at Profit. Upgrade available to Sales or Retail Agent. Wholesale Sales Channel: No upfront or ongoing cost and available upon application. Sales Agent: Appointed by MexZotic to manage a given territory to arrange, organize and attend Jewelry Parties. The Sales Agent role includes presenting the various Jewelry Designs to Party Guests, taking Orders and overseeing delivery. Paid up to 50% commission of Party Sales Order Value plus additional over-ride commission of 10% to 25% on all Group Sales Orders. MexZotic will supply all the necessary sample jewelry and training at no upfront or ongoing cost. Retail Agent: Appointed by MexZotic to manage a given territory to arrange, organize and appoint Retail Partners (Shops) to resell Jewelry to Customers. The Retail Agent role includes presenting the various Jewelry Designs to Shop Owners, taking Orders and overseeing delivery. Paid over-ride commission of 10% to 25% on all Retail Partner Sales Orders. MexZotic will supply all the necessary sample jewelry and training at no upfront or ongoing cost. Import Sales Channel: No upfront or ongoing cost and available upon application. Retail Importer/Sales Importer: Appointed by MexZotic only. Full time Position. Usually appoints Wholesale Channel Sales Agents and Retail Agents to resell Jewelry Products via the Retail Partner & Jewelry Host Merchant Sales Channel. No cost except for initial Introductory Packs and/or Sample Kits which are greatly discounted and subsidized. .
Online Importer: Appointed by MexZotic only. Full and/or Part Time Position. Usually appoints Online Resellers & Online Distributors to resell Jewelry Products via the Merchant Sales Channel. No cost except for initial Introductory Packs and/or Sample Kits which are greatly discounted and subsidized. 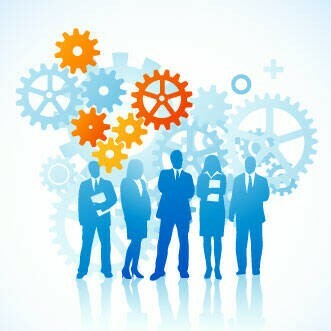 For Online Importer contact us about our FREE membership plan.